I’ve gotten mighty sluggish with my posting. And I manage to say that each time I put up a new post. And this one is going to be a long one. It seems to be a combination of procrastination and daydreaming. When I was in school, I would sit down to study, and then let my mind wander off in the middle… making a lesson I could finish in an hour take up 2 hours of my study time. Once I grew older, finished college and started working, that side of me faded away. I would just focus on the task at hand, do it quickly, do it well, and move on. I guess the nature of my work as a news producer did not leave much room for letting my mind wander. There is no ‘later’ in live news…either you get your show together or you don’t. But now that I work from home, and I have tangible deadlines as opposed to rolling news…well, there is always room for ‘later.’ I have a very comfortable schedule and I am always well in time with my submissions. But I know that I could finish so much faster if I didn’t waste a lot of time online. I have also been feeling guilty about the amount of time I spend in front of the computer. I randomly browse online marketplaces, fill up my cart and then remove the items one by one. Modern day window shopping. WASTE OF TIME. This was clearly not healthy. For one, staring at products for so long…and two, wanting all those things I clearly did not need. It was not healthy. I am certainly not deprived- I have so many unread books and unworn clothes- but the fact is that the more you browse, the nicer and shinier new things look, and the older and shabbier the things look in your cupboard. And the worst part, the one I am most guilty about- all that wasted shopping cart time could be spent with my son. I needed to ground myself and snap back to reality from my cybercloud. I have been eating beans thoran or coconut green beans since forever. My mom would make it all the time, and it is one of my favourite vegetable sides. We usually have it with rice and curry, but it can be a great meal for someone who is trying to avoid carbs and gluten. Lots of protein! The basic preparation is stir-fry style, mixed with coconut, turmeric powder, curry leaves and tempered mustard seeds.There is no right and wrong recipe, and everyone’s thoran is tweaked to their taste buds. I like adding some split black gram with the husk removed (white lentils). Mustard seeds, once they pop, add a hint of sharpness, and the black gram lends a nutty flavour. I love crunching on the browned lentils, so as you can see, I added quite a lot. That is also why I am calling my version coconut green beans instead of beans thoran… it’s not because I am trying to sound colonial. Heat the oil in a large wok. When it gets hot, add the mustard seeds and let them pop. Next, add the turmeric, split black gram, curry leaves, green chilli/chilli powder, garlic and swish around; allow the garlic to soften. Add the beans and stir fry for a minute. Add in the grated coconut and salt and mix well. ♥ Roll this up into a savoury crepe? ♥ Stir fry with some day-old rice for a quick meal in a bowl? 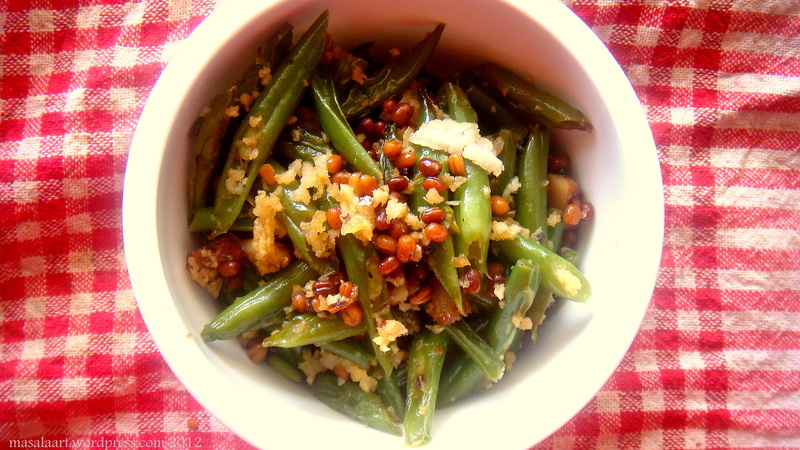 ♥ Substitute the lentils with crushed peanuts? Thanks and love to Prerna of What’s Cookin for her Liebster! More on that one real soon ! All south indian dishes remind me of home and parents/grandparents. There is something about home food that makes all of us nostalgic- even if it is the simplest of things! all sorts of thorans are fantastic. Don’t feel guilty. It is alright since somewhere the mind does know to balance it out. Motherhood is all about balancing and our maternal instinct makes sure that whatever we do outside of spending time with your children, we would make up for it at any cost. The realization, the guilt is all a part of balancing it out. You know, whenever I feel strange about how I balance my life roles, I go back and read your post, living life guilt-free. Seriously. Your green beans look fabulous. A real step up from “just steamed” which always my fall back position. I need to pick up a couple of ingredients and give them a try. Thanks! Most welcome! I hope you enjoy it 🙂 Beans are quite a versatile vegetable…but I like them with a bit of bite, so this works well. Well, Heather, I am queen for life as you can see how late I am replying to comments. So much for Eat That Frog. Thank you so much for visiting, and I am so glad you did because I got to discover your blog as well. Indian cuisine is great when it comes to vegetables- there are many ways to serve them up and lots of regional tastes!